My coworker came into work the other day complaining about a $225 heating bill. That is about 3 times as much as my wife and I normally pay! We had a couple straight weeks below freezing, so the high amount wasn’t very surprising. But it still seemed higher than it should be. When I asked him about it, he said it was only about $50 higher than normal. A few questions later I was able to determine that his house is roughly the same square footage as ours, we have the same gas company, and the reason why his bill is so much higher than ours – he leaves his thermostat set at 75 degrees 24 hours a day, 7 days a week, regardless of whether or not someone is home. I could understand this if he were married and had an infant at home at all hours of the day, but he is single and has two dogs. “Why don’t you turn the thermostat down when you go to work,” I asked? “Because I feel bad if my dogs get cold,” he replied. Of course, I didn’t say that out loud! Instead, I explained how programmable thermostats can save him a ton of money. Some quick research showed how he could save at least 20% on his monthly heating bill by installing and correctly using a programmable thermostat. You can buy one for less than $30 at many hardware stores, or on Amazon. If used correctly, the programmable thermostat could pay for itself in the first month! I also pointed my friend toward these inexpensive ways to save money on heating bills. Here is one of the least expensive programmable thermostats on Amazon. As you can see, you don’t need to spend a lot of money to buy one! 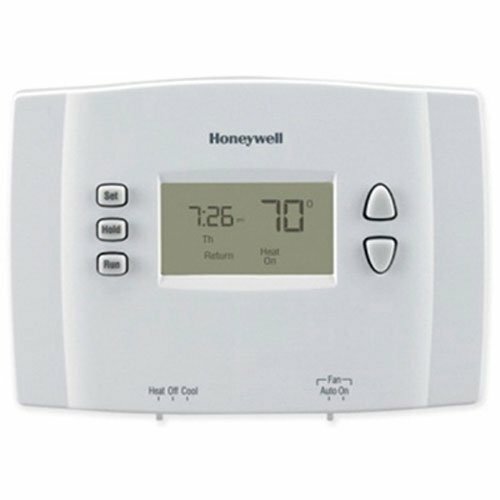 Programmable Thermostat Price: $15.99 Use this programmable thermostat to save hundreds on your heating and cooling costs. Installation is a relatively easy DIY project. Most of the thermostats have a common adapter that makes it easy to plug into your heating and cooling system. The first one I installed took less than 10 minutes – the plug was the same, but I had to use some drywall anchors to install the bracket on the wall. Just be sure to pull the appropriate breaker before working with electricity! How Much Money Can You Save with a Programmable Thermostat? The US Department of Energy estimates you can save 10% on your heating bill by rolling back your thermostat 10-15% for just 8 hours! Since he is gone 10 hours a day for work and sleeping 6-8 hours of the day, he really only needs to keep his house warm enough for his standards a few hours per day. Reducing his average temperature by 10% for a total of 16 hours per day could save him 20% on his heating bill during the fall and winter months. And that is a baseline estimate. Of course, programmable thermostats also work just as well in the summer as they do in the winter. Your cost savings will vary depending on your energy costs. But the principle is the same. Reducing the amount of energy used is better for the environment, and much better for your budget! Add a programmable thermostat to these tips to reduce your cooling costs, and you can save a lot of money each year – certainly enough to pay for the cost of the thermostat several times over in the first year alone! As for the dogs, I think they will be fine in a cooler or warmer environment. Their coat will keep them very comfortable in any at home environment. About a year ago I installed a Nest learning thermostat. These are nice because they can be controlled by a smartphone, Amazon Alexa, Google Home, or an online app. These smart thermostats “learn” your preferences and automatically make changes to save energy usage and reduce spending. Some of them are able to detect when you are away from home and they can change the settings accordingly. Of course, since you can control it with an app, it is easy to change your settings when you leave home for an extended period of time. So you don’t have to worry about forgetting to turn the thermostat up or down when you leave on vacation. We have found further savings since we transitioned to the learning thermostat, though I admit it can be difficult to quantify since you have to compare raw energy usage, the average temperature in your area, and other factors. So I’m going off the reports sent to us by Nest. There was nothing wrong with our programmable thermostat when we replaced it with the Nest Thermostat. But our electric company and our gas company were both offering substantial rebates on the purchase. I was able to buy the thermostat for $200, then get a $100 rebate from one company, and a $50 rebate from the other reducing our effective cost to $50. At that point, I figured it was worth the cost, even if it took a year or two to pay for itself. That said, I’m more than confident it has paid for itself in the year we’ve had it. If you are coming from a non-programmable thermostat, I’d say it will pay for itself within a year or so at full-price, and more than pay for itself if you can find it at a discount, or with rebates from your energy company. 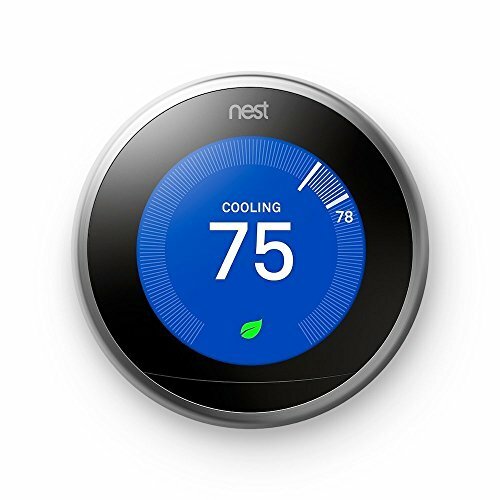 Nest Learning Thermostat 3rd Generation - Control w/ Wi-Fi, Alexa, Google Home Price: $205.00 Use a learning thermostat to control your thermostat from your smartphone, wi-fi, Amazon Alex, Google Home and more. What Temperature Should You Set Your Thermostat? The thermostat will automatically regulate the home’s temperature and you never think about it again – or at least until the seasons change. Where you set your thermostat depends on your personal preferences, costs of energy in your area, and whether or not you have extenuating circumstances, such as someone being at home all day, medical conditions which require warmer or cooler environments, etc. My friend asked what thermostat settings might be a good fit for him. I recommended he set the thermostat to automatically warm up his house right before he wakes up, then decrease to the low 60’s when he leaves for work. He can then set it to come on to 70 when he comes home from work, go down to 65 when he goes to sleep, and repeat the process. That should dramatically reduce his energy usage, and his dogs will be perfectly fine in those temperatures. These recommendations are sensible, and not too drastic of a change for most people to deal with. My wife and I actually keep our temperatures a little cooler during the winter. Our thermostat is usually set around 66-68 when we are home, and 55 at night, or when we are away. But, it is easier to make transitional changes instead of drastic changes, so I recommended the middle ground for my friend. In the summer we usually set the thermostat at 76-78 when we are at home. We try to open windows at night when weather and temperatures permit, or use our whole house fan to get a breeze going to cool us off. What is too hot or too cool for a thermostat setting? There is no “best temperature range” for your thermostat. You need to find a balance of comfort and utility usage. If you can walk around your house in shorts and a t-shirt in the winter, you probably have your heater set too high. Conversely, in the summer, if you need to wear pants and a sweatshirt to stay warm enough to be comfortable, you probably have your AC set too low. In both cases, you are probably wasting a lot of money. I find that in the winter, I want to be comfortable wearing long pants, a sweatshirt, and slippers. If I need additional layers, it’s probably too cold. In the summer, I wear shorts and a t-shirt and use fans to circulate air flow. If I’m still too hot, I’ll look at decreasing the thermostat settings to a more comfortable level. Using these rules of thumb, we’ve been able to keep our energy use to a reasonable and affordable level. There are still spikes when we have extreme weather, but it’s not enough to break our budget. Which Flat Screen TV is the Most Energy Efficient? Since my wife it as home during the day, we can’t roll it back for that period. However, we do use a programmable thermostat and set it pretty low at night since each one of us enjoys a cooler home for sleeping. Our thermostat is set to 56F round the clock (it’s one of those manual ones), but given the outside temperature (daytime max around 52F) it pretty much never switches on. DW likes to suffer, so she heats the room she’s working in with a space heater and consequently freezes whenever she moves into another room. I’m getting used to the cold and dropping more and more layers. It doesn’t feel cold anymore. Even better, stepping outside doesn’t feel cold either. Since most of the civilized world uses metric, we set ours at 21C when we are home, and then 17C when we are at work and 18C at night. That’s about 70C, 62C, and 64C. My wife and I leave our thermostat at 50°-52° during the day. In the evening, we might turn it up to 58° or so, but we turn it back down before we go to bed. We never bother to turn it up in the morning. We could get a programmable one, but we’re pretty good about remembering to turn it down and between our schedules being so irregular and our being comfortable with just throwing on an extra layer of clothes or a blanket we don’t really need the temperature up every night. It’s cold, but that’s what we get for living in Maine in the winter. That being said, our thermostat is in our kitchen near an open basement door and our front door, so the rest of the house tends to be a little warmer than that. We also have a heated mattress pad that we turn on for 10 minutes or so before we go to bed, and a space heater that we use in the bathroom when we shower at home. I keep mine set around 60 during the day, 65 while I’m at home. Its a constant war between me and the roommate that wants to live in a 70 degree environment year round! Wow, some of you all keep it cold! We use a space heater on occasion, but normally just keeping the door closed and using blankets to keep warm is enough. We both like it much cooler for sleeping, so we don’t mind dropping the temp down to the mid-fifties. Traciatim, I wish the US used the metric system. It makes sense. I used to be an aircraft mechanic, and I HATED trying to remember which fraction was bigger or smaller, especially when we used multiple fittings, connectors, head sizes, etc. – many of which went down to the 64th of an inch. Why not just use something simple like the decimal system? Unfortunately, industry is set the way it is, and it would cost hundreds of billions of dollars to change things now. Remind him that his dogs have a fur coat. I don’t know the actual temperature because we have to adjust each radiator independently. Which is kind of cool because we can keep it warmer in the bedroom at night but cooler elsewhere. I try to keep it in the high 60s. I don’t have a thermostat. The boiler heats the water to 63C and that is piped into the radiators. The house is Edwardian and poorly insulated. I would describe it as cold – think 2 sweaters and a blanket if you’re sitting about. We live in a log home so we keep our thermostat on a constant 63 degrees. A few years ago I installed a programmable thermostat and dropped the heat into the 50’s while we were at work. Well, my oil bill increased sunstantially!! After doing some reseach and questioning the oil company, we found out that it’s best to keep the temp. constant in a log home. The logs cool off quickly and take a lot to warm back up. Our furnace was practically on non-stop during the evening trying to warm the logs back up. So, I switched back our thermostats and we now keep the temp the same 24/7. If the temp outside falls to -40 below zero, then we use a ceramic heater for a few hours to warm things up a bit. Mine is at 66 right now, and that’s about where i keep it. I don’t mind being bundled up. I keep my thermostat at about 50 degrees whether I’m home or not. I have a nice fluffy robe and a pair of slippers and both my kitties came with fur coats (hahaha). So 🙂 We rarely turn it up unless I’m feeling poorly. I was shooting for 65 degrees at all times. But my hands and feet get so cold due to poor circulation. And when they are cold, they ache. So I am back up to 70 in the AM down to 68 then down to 65 when I am in bed. By the way, some people who suffer from Seasonal Affective Disorder (S.A.D.) get depressed if they stay too cold for too long. N0-I am not making this up! Just another thing to keep in mind. That sounds interesting about the logs cooling off the way they do, but it makes sense when you think about it. -40 is a little colder than I have ever experienced. My record was -20, but we were working outside for a couple hours, so I got to really experience it! Carol, I am aware of S.A.D. A lack of exposure to sunlight can have a similar effect. A lot of people are helped by spending some time under a sunlamp, which can have great results. Personally, I am very comfortable at 68, and when we go to sleep, we turn the heater low. A big down blanket works enough to keep us warm. I put mine down to 65 during the day (low enough that it never clicks on down here in TX) and put it up to 70 when I get home (where it clicks on occasionally but not often). In summer is when it really counts down here. I usually only cool the place down to 75 or 76 when I’m home, and I put it up to 87 when I leave for work. 65 day, 63 night, if not at home 60. Gas bill under $50 last month–live in California so even though it’s winter, it doesn’t get that cold. Without the heater, natural temp indoors would be 58-60. I also use 2 space heaters whenever I like it a little warmer. Electric bill was $100 higher than usual BUT was based on estimate, not actual. Last year I used a lot of electricity but have replaced all my bulbs with compacts, started switching off/unplugging applicances etc . . . so the estimate is based on last years usage and will hopefully be proven incorrect next month. I’m a bit extreme, but I leave the heat off entirely. If it gets below 60 in the house, I may turn it on. But for the most part I don’t use it at all. I live in a ~1000 sq. ft condo and my electric bill is usually about 50-60 dollars. I’ll have to agree with some others – animals have fur! We have our thermostat at 69 when we’re home and 63 during the day and overnight. Our cats’ fur gets a little thicker in the winter, so they adapt very well! I heat with oil, live in northern Maine and keep it at 60 most of the time – when it’s really windy and the wind chill factor is well below 0, I might put it up to 65 long enough for the furnace to come on then it goes back down. I grew up during the Nixon era and the energy crisis so I’m used to it. 75 degrees?! Wow-that is pretty warm. I keep ours at 71 at the most; any warmer and I feel like I’m in a sauna. I turn it down to 64 at night downstairs and usually 70 at night upstairs. During the day anywhere from 69-70 in the entire house since I’m home most of the day with the youngest. We keep ours at 62 degrees when we’re home. If I’m working from home, I’ll often use the space heater to keep my area warmer. When I at a hotel with a programmable thermostat that tells you how hot you’re setting it at, I like to set it at 72 degrees. Wow! 55 degrees at all times is a little cool for my tastes. I can bundle up to stay warm, but I do a lot of typing, and I am sure my hands would get stiff and cold. 65 when home awake. 50 at night. No warm up in the mornings. 45 when gone. Space heater in the bathroom as needed. But as I primarily use a very efficient woodstove (2 cords a year) the heat is not on much. Highest winter electric bill has been $44. Summer bill (no a/c needed) drops to $28. Sweatshirts and flannel shirts! Yes! Q. What is the most efficient thermostat setting for heating? A. The best setting is the lowest temperature at which you are comfortable. Most people can be comfortable at a setting of 68 – 70 o – each degree higher than that can increase your heating costs by 1-2%. Q. Is it a good idea to close or seal off the heating registers in unused rooms? A. Closing or sealing a small number of heating registers may cut your heating bills some, but with central forced air systems, closing off more than one-third of your registers can create pressure imbalances and make the blower fan work harder, potentially shortening equipment life. Q. I’ve heard that setting back my heat can actually cost me more when I turn the thermostat back up – is this true? A. With most heating systems, you will save by turning the thermostat back for four hours or more. If you have a heat pump, you should either set the thermostat at a comfortable temperature and leave it, or purchase a programmable thermostat specifically designed for a heat pump. I ain’t freezing my behind off just to save a few dollars. Life is too short and I (and my wife) work too hard to come home to a house that isn’t comfortable. We keep our temp at a comfortable level as well, but we have adapted to be comfortable at around 68. Obviously, something like temperature is subjective, and I know people who are comfortable with their home in the low 60s and some people who are uncomfortable if it drops below 75. We’ve switched a little this year to have more of this mentality. Plus, one of us is home almost all the time now. So ours ends up at 66F (19C) almost all the time, and if someone is feeling cold we put it up to 67F (19.5) so some heat moves around. If we plan to have other people over for a while and we figure no one will be wanting to wear slippers or sweaters then we will set it up to 68-70F (20-21C). Traciatim, We usually boost the temp a couple degrees when we have company over, too. We used to adjust the thermostat down to the 50s during the day because my wife and I both worked, but now that my wife is a stay at home mom, we leave the temp around 68 from morning until we go to bed, when it drops to the 50s. We use a space heater to heat our bedroom so it doesn’t get too cold. I agree. You don’t get any medals at the end of your life for having kept your thermostat at 55…maybe some excessively worn teeth from chattering from frostbite throughout your life. I am sorry guys, i don’t believe that i should be freezing in my own house. heating is like food. if i had to pay some extra in winter well so be it. i rather spend a few extra pounds to comfortable when i am home. Maybe we should get a programable thermostat to save 20% in summer and 10% in winter. Check this article out. i am trying to write a paper about saveing money with a progammable tremostat for collage class and i don’t know how to get the info for my bibliography page or were to get the facts can you help? I liked what you were writing about and i beleive it is true I am in the army deployed to Camp Adder Iraq and I am trying to get every one here to do the same thing. Ben, I sent you an e-mail. And thanks for your service!